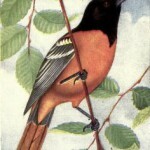 Baltimore Orioles are actually more closely related to blackbirds than “Old World Orioles”. Believed to have evolved from the Old World Oriole species, these “New World Orioles” are primarily found in the United States and Mexico. The male birds in Icterus genus and are commonly recognizable by their coloring – black, yellow or orange with white markings. On the females the yellow and orange colorings are slightly dulled. So far, the only New World Oriole drawings that I’ve found are for Baltimore Orioles but they are among the prettiest of the group, so it’s no wonder artists favored them. 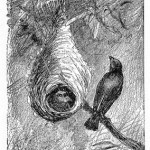 Pencil-like sketch of a Baltimore oriole nest. 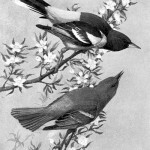 Beautiful black and white version of a painting of a pair of Baltimore orioles.